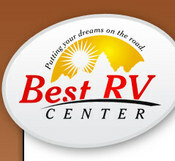 Best RV Center, located in Turlock, California, is proud to be one of the best priced, family owned, and fastest growing RV dealers in the northern California. We are a dealer that sells new and used RVs from most of the top ranked brands in the recreation vehicle industry today, brands like Coachmen RV, Cherokee, Attitude, Chateau, and Cedar Creek just to name a few. As a dealer, we want to exceed our customer's expectations at every opportunity. We provide them with a buying experience that will encourage them to come again and bring their family and friends to our California dealership. Our main goal with our Online Services is to promote the many benefits of the recreational vehicle lifestyle and to help our customers enjoy that style to the fullest. To take the comfort and security of their home to the great outdoors. Provide our customers with the best selection of new and used RVs like travel trailers, fifth wheels, toy haulers and folding campers from America's most reputable manufacturers, and offer those products at a fantastic price.